A scene from “Miss You Like Hell” at the La Jolla Playhouse. The world premiere musical “Miss You Like Hell” is a road trip that lost its way. In its semi-staged workshop at the La Jolla Playhouse earlier this year, it was charming, whimsical and heartfelt. But in striving to become a full-blown, big-stage production, this small, intimate story has lost a lot of its charm. The creators are a dream duo: Pulitzer and Tony Award-winner Quiara Alegría Hudes penned the book and lyrics, and singer/songwriter Erin McKeown composed the score and co-wrote the lyrics. The show has sturdy bones. The story is heartrending: the reunion of an estranged mother and daughter, and the realization that family has many different definitions, and this wacky, disparate country of ours forms an unexpectedly and lovingly connected patchwork community. It’s a great message for our time. The way Olivia sees it, she was abandoned by her mother, a Mexican national who left the family early on. But Beatriz, a proud and powerful, free-spirited Mixtec, was fighting for her survival, called an alien by the American (Jewish?) man who wouldn’t marry her, denied child custody and the ability to become a naturalized American citizen. Shunned by her young daughter, Beatriz left Philadelphia for California, and the two haven’t seen each other in four years. Olivia is now 16. She has contemplated suicide, she uses Spectrum-like strategies, like listing beloved literary works or fingerspelling the American Sign Language alphabet backwards, to calm herself. She’s as adrift as her mother. But her lifeline is a group of online buddies who respond to her Castaways blog, a worldwide cadre of fellow outsiders who empathize and provide support. Now, in her beat-up old blue Datsun truck, Beatriz has made her way back to Olivia, to reconnect and bond, to make up for lost time — and to have her daughter testify on her behalf during her upcoming immigration hearing in L.A., where she faces deportation. Beatriz is most definitely flawed: she’s been less than a stellar mother, though she was fiercely committed at the beginning; there was that unfortunate marijuana bust 18 years ago that dogs her to this day; and she has a survivor’s penchant for self-absorption. But she genuinely loves and cares about her fragile, disaffected daughter, and really wants to spend this concentrated seven days crossing the country together. Along the way, the two meet a colorful cast of “Others” — an aging gay couple who are wending their way through 50 states, getting married over and over, to celebrate their 50 years together (Cliff Bemis and David Patrick Kelly); the still-grieving, tamale-making Mexican widower (Julio Monge), for whom cooking is seduction, memory and love; the motherless junior ranger at Yellowstone (local powerhouse Cashae Monya); and the underprivileged Asian girl (Olivia Oguma) who hangs out at an Ohio mall and longs for “stuff” she’ll never have. All these, in their separate ways, will come to the aid of Olivia when she needs them most. That would be enough to suggest the sense of community. But unfortunately, we also get an actual embodiment of a castaway — named Castaway (Victor Chan has a wonderfully silken voice, but his character, and the little palm-tree island he stands on, are superfluous). An overly literal take on the material is recurrent. Which brings us to the real problem here: the direction, choreography and overall production. Director Lear deBessonet made her mark at The Public Theater in New York, creating pageant-style musical adaptations featuring 200+ untrained actors (she even did one in San Diego, at The Old Globe). That sensibility shows here, and it’s a total mismatch for the piece. Choreographer Danny Mefford, saddled with a cast that generally can’t dance (except for the ever-agile Monya), has created awkward simplistic moves and inane hand-motions to cover for the lack. This gives most of the chorus numbers an amateurish look. The casting was obviously for singers first, since the vocal elements are excellent throughout. 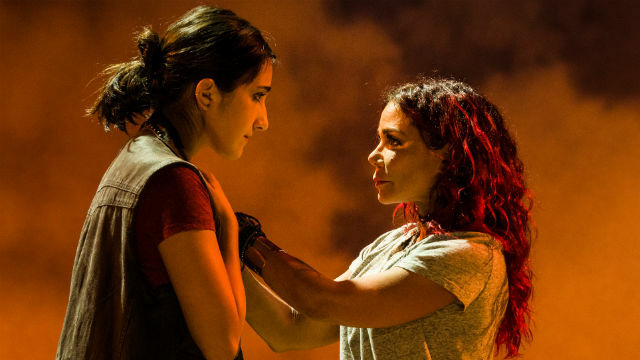 But no one on that stage, with the exception of the agile Monya and the leonine, charismatic, two-time Tony nominated star, Daphne Ruben-Vega (Beatriz), is a compelling onstage presence. As Olivia, Krystina Alabado creates a credibly sulking, resentful, taciturn teen, and her voice is strong, but she doesn’t exude magnetic appeal. And then there’s the upstage parade of American icons that shows up pointlessly in one scene: Elvis, Marilyn, Lincoln, Twain, the Statue of Liberty. Repeatedly, songs are too literally interpreted, from the butterflies to the shopping bags. Most of all, there’s an overall tonal problem. In its current state, the show veers from clever to silly, from serious to ridiculous. It seems that the production team couldn’t trust the material, let it be and let it breathe. In its small way, it touches on big themes — immigration and outsiders, family, love and the state of the Union. McKeown’s music is an enchanting and eclectic mix of styles, from pop to folky to R&B to a piquant island flavor. There are many smart, poetic, imagistic lines in the text and the songs. But they get buried beneath all the busyness and ‘business’. “Miss You Like Hell” has moving ballads, amusing numbers, and truly touching dramatic moments. I’d love to see what a different direction and design team would do with it. Performances are Tuesday and Wednesday at 7:30 p.m., Thursday-Saturday at 8 p.m., Sunday at 7 p.m. Saturday and Sunday at 2 p.m. and 7 p.m.